A region of ice the size of Greater London vanished from the edge of Antarctica between 2010 and 2016, a new British-led study has shown. The 1,463 square kilometres of underwater ice at the base of the Antarctic ice sheet melted under the influence of warm ocean water currents. Scientists demonstrated how the massive ice sheet is retreating as its edges, fed by a multitude of glaciers, are eroded. The discovery emerged from satellite tracking of the ice sheet’s “grounding line”, the boundary where the ice sheet’s base leaves the sea floor and begins to float. Grounding lines typically lie a kilometre or more below the ocean surface and are inaccessible even to deep diving submersibles. Lead researcher Dr Hannes Konrad, from the University of Leeds, said: “Our study provides clear evidence that retreat is happening across the ice sheet due to ocean melting at its base, and not just at the few spots that have been mapped before now. Grounding line retreat had been extreme at eight of the locations where the ice sheet’s 65 biggest glaciers flow into the sea, said the scientists. At these points, the ice had retreated by more than 125 metres (410ft) per year. 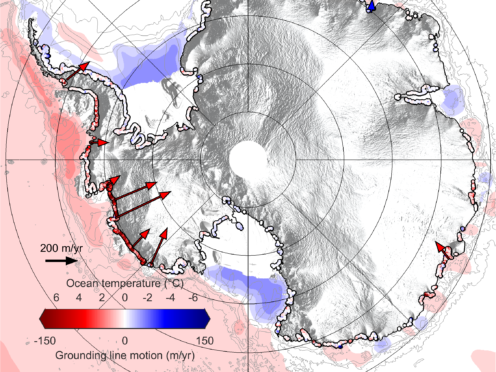 The biggest changes were seen in West Antarctica, where more than a fifth of the ice sheet had retreated across the sea floor faster than the general pace of deglaciation. The movements were tracked across 16,000 km (9,941 miles) of coastline using the European Space Agency’s CryoSat-2 orbiting satellite. CryoSat-2 is designed to measure changes in ice sheet thickness, but the information it provides can translated into horizontal motion at the grounding line. The team, whose findings appear in the journal Nature Geoscience, detected some unusual behaviour. While the retreat of the grounding line at Thwaites Glacier had sped up, at neighbouring Pine Island Glacier it had halted.